You might wonder how anyone can list with precision the world's 10 best destinations for backpackers. In truth, there could be dozens of these lists: best outdoor locations for backpackers, best big cities for backpackers, most relaxing destinations for backpackers, places that keep backpackers busiest, best spots for first-time backpackers, and so on. This collection represents some solid choices from all of those groups, and perhaps a few more. To make this list, a destination must have an ample supply of ​hostels and other low-budget accommodations. In addition, it helps to have university sections where affordable dining is available, natural beauty worthy of a big airfare tab, and sunsets that stay in the memory for decades to come. What follows, in no particular order, are 10 top backpacking destinations throughout the world. The State of Goa, on India's west coast, is among the most popular backpacking destinations in the country and perhaps in all of Asia. It's easy to see why. Goa offers 60 miles of tropical beaches, tree-shaded streets, and what often is described as a never-ending party. The inventory of hostel rooms is among India's largest. Vagator Beach often becomes a stayover spot in which new arrivals plan to spend three days and wind up staying for three weeks or three months. Hostel overnight rates come in at under $5 USD in many spots. There's a beach here for just about every taste. Some are secluded and peaceful. Others project a hippie vibe. Getting to Goa is a bit of a challenge since a major air hub does not serve the area. The nearest big airport is Mumbai, from which you'll need either a connecting flight or a train ticket. The flight takes about an hour. The train ride is a nine-hour jaunt. Pick a city in Ecuador. Any city. You can't go too far wrong. Guayaquil is the nation's largest city, with quick access to Pacific beaches. Cuenca is the third-largest city, with beautiful 16th-century architecture rimmed by Andes peaks in the distance. From all three cities, you can make arrangements to visit the Galapagos Islands. For a relatively small country, Ecuador offers a wide variety of landscapes and attractions. More good news: It's also among the cheapest countries to visit in South America. Airfares into Quito's new airport sometimes come at bargain prices. Transportation within the country is relatively cheap, and affordable accommodations abound. Chattanooga does not boast a world-class selection of hostels or a sprawling city to explore. What it does offer are adventure travel opportunities that will keep an active visitor busy for days, and without spending huge sums of money. Rock climbers find some of the most challenging venues on this side of the Mississippi River. On bad weather days, there's even an indoor climbing center in the heart of downtown, next to one of the nation's finest aquariums. Adventure travelers also find kayaking options on the Tennessee River, Olympic-quality whitewater rafting on the nearby Ocoee River, and even hang-gliding (at a budget-challenging price) just a few miles across the Georgia state line southwest of the city. Chattanooga's once drab downtown now presents a nice selection of restaurants and one of the best farmer's markets in the Southeast (late April-December). Hiking opportunities abound in nearby national forests, and Great Smoky Mountain National Park can be reached by car in about two hours. A great hostel option — if you can get a reservation — is the Crash Pad in the heart of the city. It caters to a lot of rock climbers, but everyone is welcome. This "boutique hostel" offers free breakfast and curtained bunks starting at $35, with private rooms also available. Nicaragua ranks among the least-expensive countries in Central America, in part because it has less tourism development than neighbors such as Costa Rica. Rest assured that Nicaragua is being discovered these days, and San Juan del Sur is one of the new hot spots. This is the surfing capital of Nicaragua. It has transformed from a sleepy fishing village to a tourist hub in a short time. For that reason, it might be one of the more expensive destinations in the country, but remember that an expensive place by Nicaraguan standards still is likely to rank as a bargain almost anywhere else. If San Juan del Sur grows too crowded for your tastes, board one of the so-called chicken buses (cheap but sometimes slow local transportation) and explore the region. Experience secluded beaches, pristine islands, and volcanic peaks. San Juan del Sur is on the Pacific coast of Nicaragua, and the nearest major airport is in Liberia, Costa Rica, in the popular Guanacaste Province. Liberia offers non-stop service to U.S. destinations, as does Managua to the north. Alas, the year of free admission to Canadian national parks ended on the last day of 2017. Take heart: Visitors under age 17 are admitted free as of January 2018. The prices charged for gaining admission to some of the world's most spectacular scenery always are a bargain. Opportunities for hiking, camping, and exploring in parks such as Banff, Jasper, Glacier, Yoho, Kootenay, and Mount Revelstoke will keep a backpacker busy for days, and expenditures are modest compared to many other tourist zones. Not all of the attractions are in the wild. Major cities such as Calgary, Edmonton, and Vancouver have been welcoming backpackers for generations. Vancouver is the most popular and offers a nice selection of budget accommodations. Keep in mind that distances here are sometimes greater than many new arrivals expect. Banff-Vancouver is a 525-mile drive, and it involves a number of mountain passes. Those who commit to it also are rewarded with some gorgeous vistas. 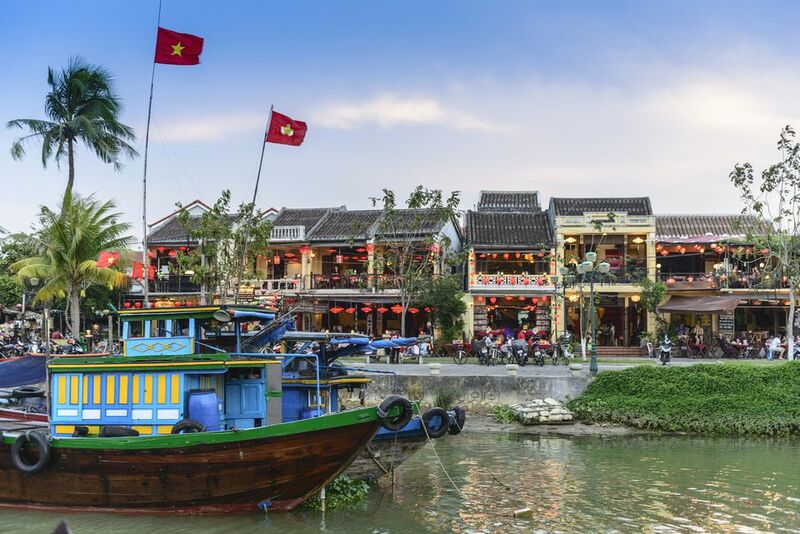 Seemingly far from the bustle of the big cities, Hoi An is a smaller place in a beautiful setting. It qualifies as a UNESCO World Heritage Site, and it is also the custom-made clothing capital of Southeast Asia. One more enticing bonus: The French influence is alive and well through the bakeries that line Hoi An's streets. Sample delicious pastries and then walk off the calories exploring the area on foot. Another must-try dish is Cao Lau Noodles. In Edinburgh, a new wave of backpackers arrives at Waverley Station several times per day. The local residents are generally comfortable with the new arrivals, and there are certainly enough amenities and attractions here to keep a budget traveler busy. A second-class. one-way fare from London is less than $90 USD, and many backpacking travelers ride the rails to this historic gem of a city after sleeping on a night train. Edinburgh offers an extensive selection of pubs, hostels, and budget hotels. Unlike London or Paris, the major attractions are found in a relatively compact area navigated mostly by foot. It is a university town, with the expansive and highly regarded University of Edinburgh just a short walk from the city's famed Royal Mile historic district. It's possible to enjoy the beautiful views and ancient sites without spending a lot of money. Edinburgh Free Walking Tours offers two daily trips of 90 minutes each; both start near St. Giles Cathedral each afternoon on the Royal Mile at 12:30 and 2:30. Although free, it's customary to offer a gratuity once the tour ends. Another European city with a large university population and plenty of historic charm is Munich, Bavaria's largest city. Look for budget hotels and hostels near the hauptbahnhof (main train station) just west of the city center. The Maxvorstadt area hosts several universities and is a great place to find inexpensive meals and chance meetings with other travelers on the same tight budgets. Hipsters flock to the Gärtnerplatz area. Beer gardens (packed even in the winter months) serve a delicious roasted chicken dish called hendl that is both consistently good and easily affordable. Munich also offers easy connections to the Romantic Road, Salzburg, and the Alps. What a great travel hub! For most of us, airfares to New Zealand present a serious budget challenge. Getting to this gorgeous island nation represents a significant investment of time and money. Should you ever find yourself with that exciting opportunity, don't miss a favorite stop on the backpacking trail — Queenstown. The views from Queenstown Hill are stunning, especially at sunset. There also is much in the way of outdoor adventure to explore, including bungee jumping, kayaking, and stellar hiking. Sometimes, the townspeople in such settings resent backpackers. That is not the case in Queenstown. The town embraces this popularity. New bars and hostels open regularly to serve interested travelers. Why the growing popularity? One factor might be the many scenes from the Lord of the Rings trilogy that were ​filmed in the area. Backpacking Morocco often means navigating the frenetic bazaars of Marrakesh, or braving a few days in the Sahara. For those who want smaller markets and refreshing ocean breezes, there is Essaouria, on the southern coast. Although less chaotic than some Moroccan cities, it is more than a quiet fishing village. Many weary travelers prefer the more relaxed buying atmosphere Essaouria offers its guests. This coastline is a favorite of surfers and fishermen. The fish market is worth seeing. Make a purchase and the local restaurants will cook it for you. As with Queenstown, Essaouria draws interest from popular culture. Its coastal fortress is featured in Game of Thrones.